I cannot imagine the feelings of grief and outrage the owner of these three dogs must feel. Last week, I posted an uplifting story of a pit bull named Ember who was rescued by fire fighters, and she then became the fire station’s mascot. Those types of stories, with fairy tale endings, are all too rare. I cherish each one that I read. Sadly, this week’s story is more common. Once again, pit bull lovers, and those who loves justice, were dealt a blow when three pit bulls were ordered to be killed. What was their crime? Surely, any reasonable person would think that the dogs must have attacked and killed a person unprovoked. However, that is far from the case. From the news reports I’ve read, their only crime was being the victims, not the perpetrators, of an attack by an unleashed dog. 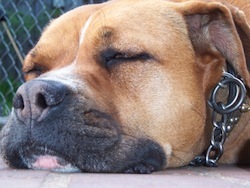 Seemingly, because they were pit bulls, being a victim of an attack is a crime worthy of the death penalty. More disturbingly, two of the dogs are NSAR emotional support dogs, which indicates they have a certain amount of training and temperament testing. Their senseless killing would be a devastating blow to anyone who has a beloved dog as a family member. How much more debilitating would that blow be to someone who needs emotional support? I cannot imagine the feelings of grief and outrage the owner of these three dogs must feel. I believe he will continue to fight for some justice for their deaths, and I can only hope that the injustice of this case opens the eyes of people who would willing kill innocent dogs merely because of their breed.